What better time of year could there be to call forth the spirits than during this Halloween season? 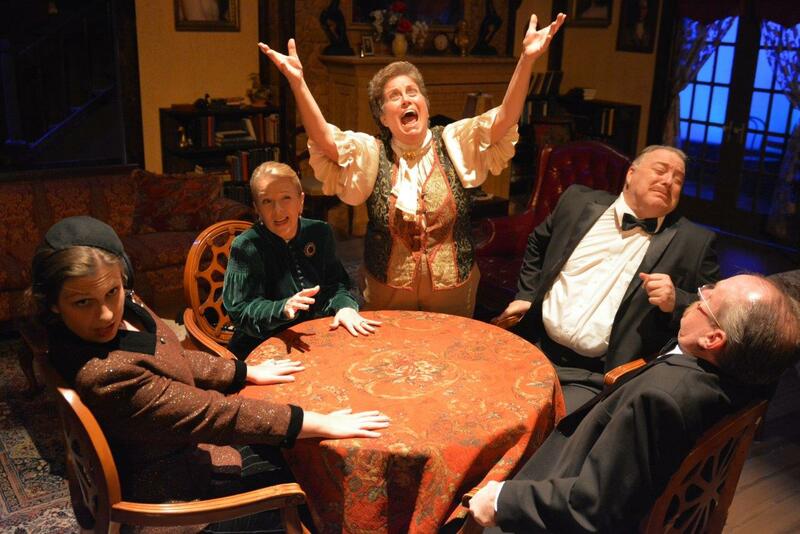 And what better way to do it than with the Texas Repertory Theatre Company’s current spooky production of Noel Coward’s classic comedy, Blithe Spirit? Skillfully directed by Scott Carr, this most recent Texas Rep winner combines terrific acting from a fine cast with a tremendous respect for the wit and sophistication of Mr. Coward’s timeless play. The story takes place in the lovely home of an English novelist and socialite Charles Condomine (Steven Fenley). The timid and somewhat bumbling maid, Edith (Haley Cooper) tiptoes about as the action unfolds in the elegantly furnished Victorian living room (Scenic designer, Trey Otis). Charles is married to his second wife, charming and elegant Ruth (Lisa Thomas Morrison), having lost his first wife, Elvira (Lauren Dolk) to an untimely death some seven years earlier. Charles and Ruth are gleefully enjoying dry martinis while awaiting their dinner guests, Dr. and Mrs. Bradman (Ted Doolittle & Katie Curry). The couple’s glee centers on a planned after-dinner séance featuring noted area psychic, Madame Arcati (Marcy Bannor). Charles, it seems, is brainstorming for a novel he is writing about a homicidal medium. Skeptic though he is, he thinks a close encounter with a psychic would be helpful to his work. The hilarity unfolds when Arcati (a deliciously zany performance from Ms. Bannor) arrives looking a bit like some wild-eyed female pirate with her flared sleeved blouse, trousers, vest and high boots. The séance results in the arrival of Charles’ late wife, Elvira, but only Charles can see and hear her present in the room. This circumstance leads to all manner of merry mix-ups and misunderstandings that keep things uproarious most of the time. The acting from this troupe is outstanding. Fenley and Morrison seem to really “own” this witty script as they move freely about the stage and deliver the clever lines of Noel Coward with rapid-fire skill, perfect enunciation, and no visible microphones I was aware of. These are actors that know how to project their voices from the stage as in days of old. Ms. Bannor followed suit offering a wonderfully nutty characterization of Madame Arcati with all her wacky antics, as the problems created by a spirit returning from “the other side” propel the plot. Miss Dolk gives us a spirit that is devilishly blithe indeed, and there are dependable performances as well from Doolittle and Curry. The costumes for this cast from designer, Macy Lynn, are outstanding, and the special effects (lighting designs by Eric Marsh) nicely complement the mysterious proceedings. To say much more would give away some of the most amusing twists and turns. Why not drop by and see for yourself? 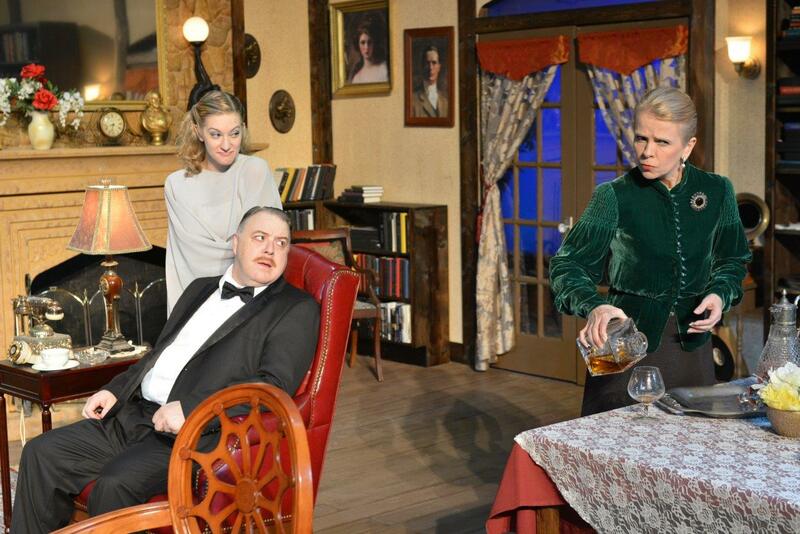 BLITHE SPIRIT continues through November 10th at Texas Repertory Theatre in the Northwoods Plaza at 14243 Stuebner Airline Rd., Houston, Texas. Remaining performances will be Thursdays at 7:30 pm, Fridays & Saturdays at 8 pm, and Sundays at 3 pm. For tickets and information call 281-583-7573 or visit the website at www.TexasRepTheatre.org. 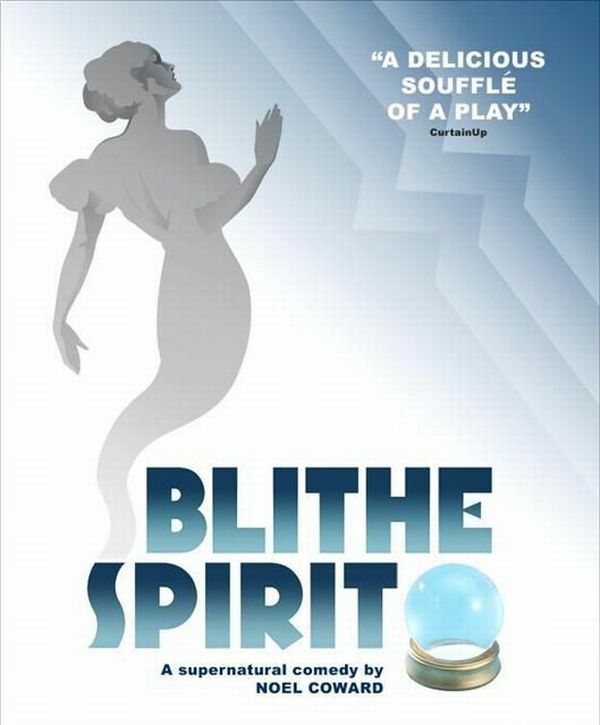 This entry was posted in Blithe Spirit, Broadway, BroadwayStars.com, HERE Lifestyle & Entertainment, HereHouston.com, Houston Community Newspapers online, Noel Coward, Texas Repertory Theatre, The Courier Columns, The Villager Columns, Theater Reviews, ThePeoplesCritic.com, YourHoustonNews.com and tagged Blithe Spirit, Broadway, comedy, Houston, Noel Coward, Texas Repertory Theatre. Bookmark the permalink.